Please note that due to the innovation of our business payment methods and guides are often subject to adjustment. Therefore the below information may change without notice. Welcome to the merchant back office. Our intuitive and versatile interface makes it easy to use all the functions, from running reports to processing transaction requests. Just navigate the tabs on any of the pages to access the function you need. During the log on you will be prompted to enter a username and password that will have been supplied to you. The Account Statement tool provides you with immediate, current information on yourmerchant account, including your up-to-date balance and your next payment date. Your merchant account is actually subdivided into three sub-accounts, which you can view at any time. One of these sub-accounts is your Current Account, in which most of your account activity will occur. This is the account into which Settlements are made when your clients purchase goods/services from your site. Here you will also see debit items such as fees you were charged for transaction processing and amounts held for rolling reserve. 2. 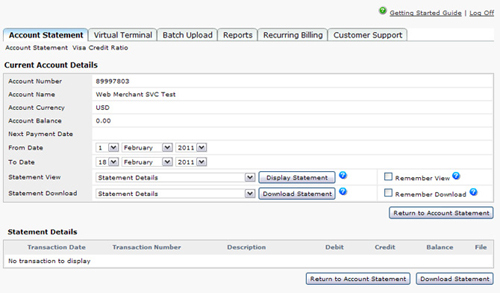 Click the Account Statement submenu. 5. Select a date range from the From Date and To Date drop-down lists. 6. Select your preferred display parameters from the Statement View drop-down list. Statement Details – This lists a separate entry for each item in your account. Statement Summary & Details – This provides the list and summary of items in your account. 8. Click on a link in the Debit or the Credit column. The Transaction Details page opens. The Transaction Details page displays a variety of information, depending on the transaction type you drill down on. For example, for a credit entry due to Settlements into your merchant account, you can view the transaction date, the amount, and the card brand used. For a debit entry due to transaction fees, you can view the card brand used, the transaction type for which the fees were charged, and the transaction fee totals, by card type. The Virtual Terminal is supplied with our standard account and can be accessed using the same screen as the CMS. The demo below explains how to use the Mail and Telephone Order Payment Service (MOTO). For banking security reasons we are unable to provide an actual test account, but have duplicated what the page will look like exactly. You can view both the Basic terminal or the Advanced terminal which both of which come with the account. The reports screen allows you to view a whole host of information including activity reports, chargeback history, batch report, view settlements, issue refunds etc. Activity reports are real-time reports that provide detailed information on credit card transactions that have been processed through your merchant account. You can select a variety of search criteria to narrow or broaden the report as required. You can view summaries of transaction types (e.g., you could view all Purchase transactions), and you can also drill down to view details on individual transactions. You can reverse a credit card Authorization transaction request from the Transaction Detail page, provided it has the status of Authorized. An Authorization has this status when no settlements – either full or partial – have been processed against it. You can reverse an Authorization transaction only – you cannot reverse a Purchase transaction. Processing a Settlement allows you to settle a previous Authorization. You must run an activity report to locate the Authorization you want to settle. The Cancel Settlement transaction allows you to cancel a Settlement that is still in a Pending state. Both a Purchase transaction (which both authorizes and settles a transaction) and a Settlement transaction are Pending until they are settled at batch time, which is usually around midnight of the day they are initiated. You must run an activity report to locate the Settlement you want to cancel. In order to issue a refund to a credit card, you must first use the activity report tool to locate the original Purchase or Settlement, and then issue the credit against that transaction. Batch Upload tool – simple, functional, and efficient. The Merchant Batch Process allows you to easily process Purchase, Authorisation, Settlement, and Credit transaction requests through the transaction processing engine, simply by creating a CSV file and uploading it via a secure FTP connection. When you process transactions using this method, you can also use the back-office tools to run reports on your transaction requests, to view their status, totals etc. All you have to do is create CSV files to upload to the transaction processor. 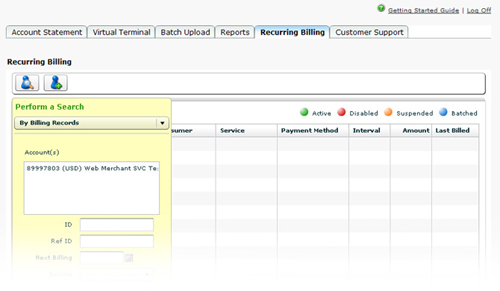 You can combine any type of transaction request in the same CSV file. We supply a secure FTP (sftp) application that is easy to install and use. 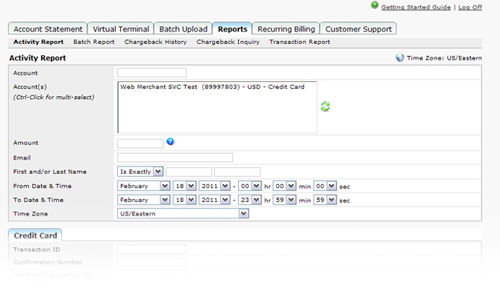 You use a simple drag-and-drop interface to upload your transaction file at any time. The Recurring Billing tool allows you to create recurring billing records that will ensure regular, trouble-free payments from your customers for goods or services you provide on a regular, recurring basis. Once you set up a recurring billing record, you can basically forget about it. We do the rest, processing the recurring transactions for the amount, at the frequency, and over the time period that you specify. The Recurring Billing tool also allows you to search for recurring billing records to view their status and/or modify them at any time. The customer support screen provides all the documentation you need including manuals, guides and trouble shooting. From within here you can also change passwords, account settings etc. You can even view tutorial videos.